There is no magic food or "super food" that can make menopause symptoms go away overnight. However, there are some foods, or groups of foods, that can help improve your overall health and well-being if incorporated into your diet. 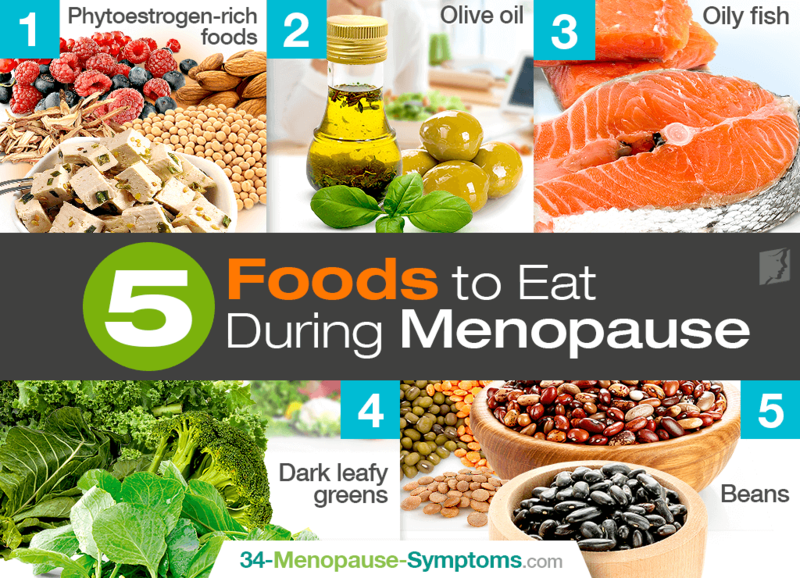 Continue reading to find out five best foods to eat during menopause to help combat your pesky symptoms safely and effectively. Research on phytoestrogens is conflicting, but many believe that a diet rich in phytoestrogens can help reduce menopause symptoms and the likelihood that a woman will get osteoporosis. Phytoestrogens are compounds found in plants that act like estrogen in the human body. Foods rich in phytoestrogens include soy, licorice, and a variety of fruits, vegetables, and legumes. Olive oil is one of the best oils to cook with and consume as it is heart-healthy with little to no saturated or trans fats. Olive oil can be used to make a homemade salad dressing, and it is also good for frying, sautéing, and roasting. Other healthy cooking oil include canola oil, peanut oil, sesame oil, sunflower oil, and avocado oil. Oily fish are an excellent source of omega-3s as well as vitamin D, protein, B vitamins, and selenium. Regularly consuming them can lower a person's risk of cardiovascular disease, age-related vision loss, and dementia. It is recommended to eat a couple servings of oily fish - such as tuna, mackerel, sardines, and salmon - every week. Dark leafy greens are rich in fiber, folate (vitamin B9), carotenoids, vitamins C and K, iron, and calcium. All of these nutrients provide innumerable health benefits, such as improved digestive health and a lowered risk of developing osteoporosis and dementia. Dark leafy greens include arugula, spinach, kale, collard, beetroot, broccoli, watercress, mustard greens, and many others. Because they are loaded with protein, antioxidants, isoflavones, and calcium, beans are some of the best foods to eat for perimenopause. They also promote a healthy weight, reduce heart risks, lower fatigue, strengthen bones, and boost memory. Moreover, beans are rich in fiber, which also helps improve digestive health, though high bean consumption may cause bloating. While eating a balanced diet is integral for a woman's overall health during menopause, the foods that one chooses not to eat can have just as big of an impact. Fried and processed foods as well as those high in carbs can increase a person's risk for heart disease, diabetes, and some cancers. Click on the following link to learn more about treating menopause symptoms with food and other safe and natural approaches.